NewCardigan's GLAM Blog Club is out of the blocks for another year, providing helpful monthly writing prompts for for people who work in galleries, libraries, archives and museums. Recognising that the transition from one year to the next is often a time for reflection, this month's theme is the same as last January's: What I want to learn in the year ahead / What I learned in the past year. If 2016 was the year that I began to more fully embrace my role as a hybrid library/IT professional, 2017 was the year I lost my ambivalence about becoming a manager. I transitioned into my first management role in late 2014. This happened after many years of telling myself that this was not the pathway for me. I was so convinced of this that I spent a year in a mentoring program ten years ago identifying career pathways that would help me avoid management roles without completely stalling my career progression or meaning that I couldn't have a leadership role of some kind. In 2014 I saw a job ad that changed my mind for three reasons. Firstly, it was working for someone that I admired, who I knew would be a good role model, mentor and source of support. Secondly, I had been in the organisation for long enough to know it had good frameworks in place for developing staff who were moving into supervision and management. Thirdly, I was starting to realise that as lots of library profession leaders were transitioning to retirement, someone would need to take their place. Could that be me at some point in future? I felt scared to step up and take on a lot more responsibility than I had ever had before. But if I asked myself the question If not now, then when? the honest answer was There won't be a better time, you idiot! so I decided (with encouragement from my partner, friends and some colleagues) to go for it. 2017 was my third year in that management role, which recently expanded to cover both library systems and research repositories. Last year a lot of things finally starting 'gelling' for me. My learning has not just been about management in an objective sense i.e. what tasks are involved, and what is expected of someone at that level. I've also had to consider what management means (or could mean) to me. My ideas of what a management role involved were very limited prior to actually having one; I now know my existing knowledge and skills were more transferable than I thought. I also understand much better how some of my strengths can be expressed in a management role and how I might address some of my weaknesses over time. Here are some thoughts on this process that might help you feel better about taking this plunge at some point. I though most of my job would be about supervising people but actually a not-exhaustive list of the things that I manage includes staff, business processes, systems, time (my own and that of others), corporate information, risk and compliance, budget, procurement, contracts and vendor relationships, recruitment, projects, policies/procedures, a workspace, and health and safety. Yes, managing people is a large and important part of this, but it is definitely not everything that I do. If you are managing lots of things (see above), it makes sense that you will be better at some things than others, right? Of the list above, I'd self-assess as really competent at some, including a few things that other people probably find difficult or very very tedious. If you need to run a tender process or to review and negotiate a systems contract, I'm your go-to gal. I can spin up a position description and run a recruitment exercise for a new job, no worries at all. Spotting a copyright / privacy / reputational risk at a thousand paces or working well with pernickety folk responsible for compliance with IT architecture and governance are also things I know I can do. But then there are other things I still find difficult and will likely spend the next twenty years trying to incrementally improve. Finance-related tasks that do my head in seem to be a breeze for others. Managing staff remains a work-in-progress; as an introvert with a preference for logic and systems I find it really challenging to lead a group of human beings who all bring their own backgrounds, thought processes, motivations, emotions, interests and relationships to the workplace. On bad days I feel like I will never even really understand other people I work with, let alone be able to motivate or inspire anyone. What I have learned is this: I don't need to be great at everything. Not only that, from three years of observing management-level peers and superiors, I now know that not only am I not good at everything, neither is anyone else! Everyone is just trying to do their best and everyone has their blind spots. It's not even possible that any one individual could flawlessly handle everything a management role in a messy, ambiguous, ever-changing 21st century organisation might throw up. Three years in, I know that there are plenty of ways in which I am a good manager. I also know that the best way to deal with the things I'm less good at is to acknowledge them and ask for help. In my experience this will be freely given because our profession is full of lovely people who want to help other people succeed. This recent Huffington Post blog article provides a neat introduction to what this might mean in the workplace. 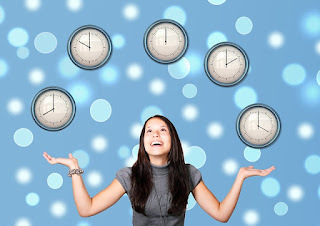 It describes self-management as demonstrating "self-control and an ability to manage time, priorities and decision-making capacity." For me this has meant coming to grips with a number of things. Here are just some. This is an uncomfortable truth for those of us at the introvert end of the spectrum. Being a manager (or a leader of any kind, really) means you are a role model, whether you like it or not. People are taking notice of the way you present yourself (both in person and online), what you say and the actions that you take. You just have to get used to it. Does being watched and judged mean that you should pretend to be someone you are not? No. It's definitely important to be authentic and to develop your own management / leadership style that works for you (and your organisation). It's OK to be yourself, but important to think about how you are presenting that self in a professional context. Outside of work you wouldn't go to a wedding in the outfit you do your gardening in, or talk to your nana the way you talk to your friends. That doesn't mean you're being inauthentic or untruthful; it just means you are gloriously mutable, like every other human being ever. In management, as in the rest of life, there's a performative aspect that you can choose to be scared of or choose to control (most of the time I still waver somewhere inbetween). With heightened visibility comes heightened responsibility. If I am sad or angry or frustrated or stressed, if I roll my eyes at someone's idea or burst into tears in a meeting, that will have an impact on other people. This doesn't mean striving to have a poker face on at all times or to be an automaton without any feelings. It does mean acknowledging the feelings that you have (especially those you are trying to hide from others, and even from yourself) and trying to express these in timely and constructive ways that don't hurt other people. I'm not always very good at this and hope it's something I can get better at in future. This includes being more careful about commitments I make and learning how to say no to things. It means actively managing time; blocking out chunks in the work calendar so that high-priority work can be done without distractions; restricting email checking to allocated times during the day; and ensuring meetings I make are not just talkfests but actually have outcomes. Librarianship is knowledge work, but don't believe for a second that being physically fit won't help you be a better manager. Losing weight and getting more active has given me more energy and concentration. It also reduces the risks associated with sitting at a desk in front of a computer for 40+ hours a week. I walk through native bushland once or twice a day, just taking the time to slow down and observe incremental seasonal changes in my local environment, and this reduces my stress levels and puts a lot of trivial work-related things into perspective. Reading fifty-plus novels a year gives me the same pleasure now that it did when I was a bookworm child; now it also gets me out of my own busy head for a little bit of time each day. In 2017 I started to embrace my new role and to reflect more on what a satisfying career path in library management could look like. I don't have any firm ideas yet, but I am looking forward to finding out what comes next! If you have been thinking about a management role, but have been putting off applying for things through lack of confidence or lack of insight into what the role actually involves, why not make 2018 your year to explore this? You might be pleasantly surprised by what you find.